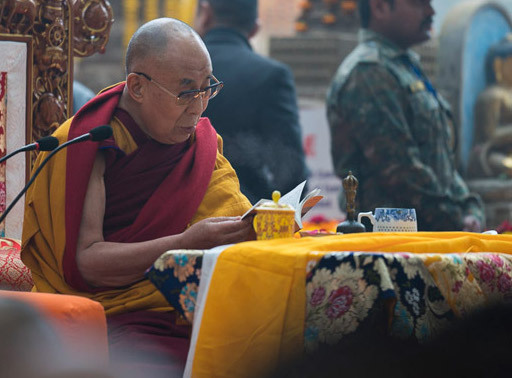 Bodhgaya, Bihar, India – Winter’s chilly fog had returned this morning when His Holiness the Dalai Lama made the short journey from Ganden Phelgyeling to the Mahabodhi Stupa. After saluting the Vajra Asana and the Bodhi Tree, he walked around the stupa, waving to members of the public who thronged the garden, entered the temple and lit a lamp in front of the renowned statue of the Buddha. After completing the circuit, continuing to greet people as he went, His Holiness took his seat facing the Bodhi Tree. Following the Chant Master’s lead he then joined in prayers being held to mark the fifteenth death anniversary of Khenpo Jigme Phuntsok, the celebrated Nyingma Lama around whom the thriving Buddhist community of Larung Gar gathered in Tibet. After a quarter of an hour, His Holiness returned to the Tibetan Temple where he took part in a meeting of Gelukpa Abbots and teachers. Shartse Khensur Jangchub Chöden welcomed His Holiness, the Ganden Tripa and other distinguished guests and invited the Ganden Throne-holder to open the meeting. Tri Rinpoche declared that at this propitious time, when His Holiness is giving teachings and empowerments and the Gelukpa Mönlam is being celebrated in Bodhgaya, it was appropriate to discuss how to improve education in the Gelukpa seats of learning. 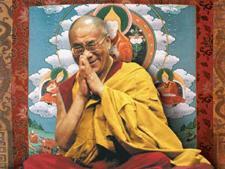 He expressed gratitude for His Holiness’s teachings and advice, and prayed that he live long. “The teaching of the Buddha is about taming the mind not merely on the basis of faith, but in dependence on reason and logic,” His Holiness averred. “However, the general public in Tibet didn’t pay much attention to this. It was the monastic community’s responsibility to study and learn. After we came into exile in 1959, we re-established our centres of learning. But it wasn’t until my first visit to Europe in 1973 that I really came to appreciate that we could learn from others and there was a great deal they might learn from us. Responding to a Geshé who told the meeting that he had studied for more than twenty years but didn’t feel it brought about the inner transformation he sought, His Holiness agreed that in addition to scholarship, there is an urgent need for people with real experience. Another teacher mentioned difficulties being faced in Mongolia, a traditional Gelukpa stronghold. Proponents of Dolgyal misleadingly assert that they are the true holders of the ear-whispered Gelukpa traditions, which creates confusion. In addition, Christian missionaries establish education and health facilities with a view to converting local people. While expressing his disapproval of such behaviour, His Holiness made clear how careful he is not to be seen to be propagating Buddhist teachings in Judeo-Christian countries.